Most people are probably familiar with the Vietnamese rice paper or known as bahn trang. They are sold in dried form in round packages. When the dried rice paper comes in contact with water, it will soften and hence allow you to use it for wrapping. I really like using rice papers as wrappers because they are quite resilient (if you soak them properly) and easy to work with. The inspiration of this vegetable spring rolls comes from A Taste of Hawaii cookbook by Jean-Marie Josselin. I made some adjustments to the recipe however. This vegetable spring rolls with coconut and peanut dip are so amazing. Most people know that I’m a carnivore, however, don’t let the word vegetable makes you think that it’s not going to be satisfying. 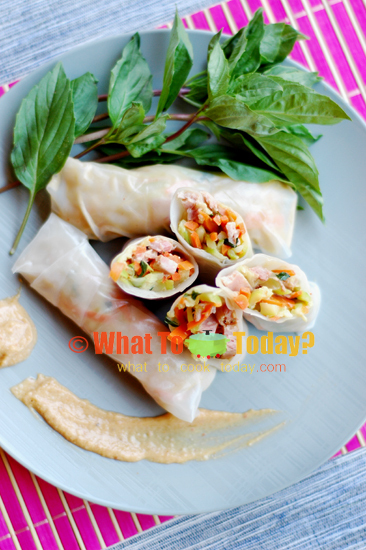 In fact, this vegetable spring rolls are healthy and packed with good nutrients. The fillings are made of carrots, zucchini, tofu, bean sprouts and last but not least, basil leaves and they are stir-fried with garlic and ginger. The coconut and peanut sauce is super good! If you ask me, the sauce tastes something in between curry and satay sauce. I always love fusion elements in food. 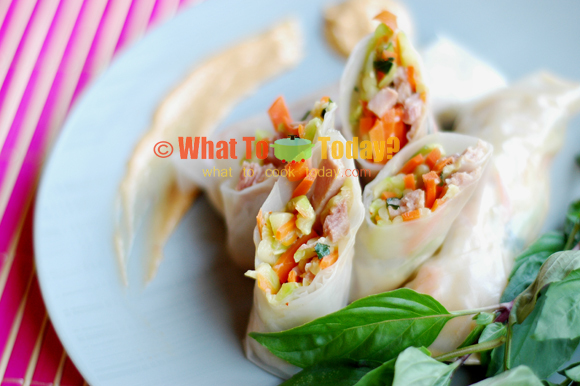 This vegetable spring rolls with coconut and peanut dip are something you can eat and satisfy your palates and feel good at the same time because they are healthy!! This recipe is definitely a keeper. Not to mention I don’t have to heat up the whole house during summer time from all the cooking in the kitchen. 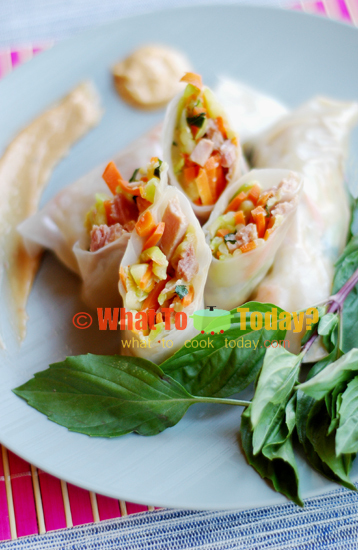 Just a very easy stir-fry for the filling and you will have your vegetable spring rolls with coconut and peanut dip in no time.